Quick, what’s the first thing you think of when you hear “World Superbike?” These days I think British Superbike. 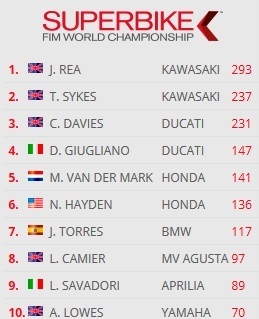 Look at recent World Superbike (WSBK) top ten championship standings. There’s one U.S. rider (go Nicky! ), one Dutch, two Italians, one Spaniard, and FIVE British, including the current top three. There have been seven rounds so far, 14 races, and all but one (yay Nicky!) has been won by a British rider. What’s the deal? In the 1980s and 90s it was AMA Superbike that fed the world’s racing ranks: Freddie Spencer, Wayne Rainey, Eddie Lawson, Kevin Schwantz, Doug Polen, Ben Bostrom, Fred Merkel, Scott Russell, Nicky Hayden. All World Champions, who raced AMA Superbikes at some point in their career (did I miss anyone?). The last one was Ben Spies, 3-time AMA Superbike Champion who took the World Superbike title in 2009. Since then not so much, and it’s been seven years. The 2013 AMA Superbike champion Josh Herrin raced in the 2014 Moto2 World Championship with poor results and was replaced before the season ended. So what is it about British Superbike (BSB) that makes its riders so successful on the world stage compared to MotoAmerica Superbike (MSB)? Do the BSB bikes have similar tunings and power to the WSB bikes? It doesn’t sound like it as the announcer at the Donington WSB race said BSB times are more than a second per lap slower than WSB. I took a quick look — the rules are long and a quick look is all the time I could spare — at the WSB, BSB, and MSB rules regarding engine modifications and there wasn’t much difference between BSB and MSB. That doesn’t seem to be the explanation. The tires are different. WSB and BSB use Pirelli tires, MSB uses Dunlop. So MSB racers moving up to WBS need to get used to different tires while BSB riders don’t. That’s an advantage but it’s not big enough to explain the difference. Let’s take a look at the top ten in the MotoAmerica standings. Current leader Cameron Beaubier is young and talented and will likely move onto the world stage someday. Riding for injured Sylvan Guintoli at the recent Donington Park WSB event, did well to qualify 9th. He crashed on lap one of the first race but finished a decent 10th in race two. That’s not bad for somebody who was suddenly thrown in at the deep end. Josh Hayes is a great rider but is too old to be of interest to any WSB or MotoGP teams. Roger Hayden? He’s good but he’s got to start winning more often before he’ll get noticed. Josh Herrin is a former AMA Superbike Champion but he’s been there and done that and it didn’t work out.The other U.S. riders on this list just don’t seem strong enough, in my opinion. MSB is just getting re-started after the series was run into the ground by the Daytona Motorsports Group. I think KRAVE are doing OK and there’s some good young talent, especially in the Supersport and Superstock 600 classes. We’ll see who emerges. Back to the main question: what makes the BSB series such a good feeder of riders into WSB, and MSB doesn’t? I really don’t know. Does anyone have an answer to the question? An opinion perhaps? I got a few good responses so I’m including them here. I couldn’t help myself and I corrected some typos and misspellings. First one is from Peter Newell. Peter Newell: BSB is an interesting phenomena and I think it succeeds because it didn’t want to be WSB. To do so they limited engine specs to basically hot superstock motors but most importantly they introduced unified software to reduce development costs. After attending several BSB races over the past four years I could see it was working because BSB supported or ran concurrently several ‘feeder’ series (Aprilia Super Teen, 125 GP, 600 Superstock) that produced a lot of well honed talent that could move up the ladder. BSB fields are deeper with talent and bike prep standards for mid and lower grid placed teams are higher than the US. I think BSB succeeds because there are no factories involved so then there are four to six well turned out and well tuned bikes scrapping to win races in all the classes. WSB discovered the BSB ‘secret’ when its grids shrank as SB development costs went up and so they went back to superstock specs and detuned the electronics so that the factory bike lost about ten horsepower as well as their technical development edge that they used to hammer the lower order teams. BSB rider were I think more ready for the detuned bikes and they were up to speed on the Pirelli tires. Next up is Steve McLaughlin, the man who created World Superbike in 1988. Kent Kunitsugu: Steven McLaughlin pretty much hit the nail on the head. BSB thrives because of its home country’s passion for racing, the short distance needed to travel to those races, and the series’ well-honed sponsorship-garnering skills. The factories are involved in BSB, and they have been for decades; it’s just more of a backdoor material support effort than anything else. Japanese riders like Kiyonari, Haga, and Fujiwara didn’t race there because they loved the food. Also, the Pirellis used in WSBK are a far cry from the Pirellis used in BSB and other national series.